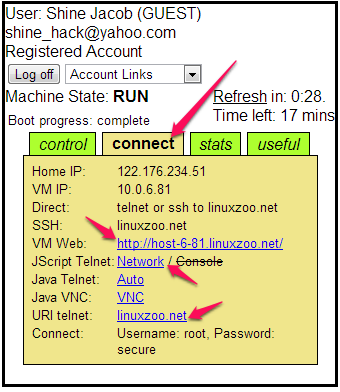 Linuxzoo is a free shell account that lets you remotely access a Linux system and help you get started with Linux. As this free shell account is based on the web, you can use any of the free telnet clients, like the famous one: Putty or even the Windows Telnet client to access the Linuxzoo server. With this free shell account you don’t have to think about the complications that you might come across while installing a Linux operating system in your computer and eases your transitions from a beginner to an advanced user (or even an expert). So, installation is not an excuse for you to not get started. You might be very good with Windows Operating System because you’ve been using it since you’re school days. Maybe you like it cuz it is prominent and spends lots of Benjamins on advertising its products. However, if you’ve never used or thought about getting started with Linux, I would say it on your face, “You’re missing something really great”. I am not trying to pull someone’s reputation (and I can’t) here but if you still believe that we’re alone in this Universe then think again. Cuz we have a planet called Linux with pleasant weather. Now, if you’re already in the space ship and ready to press the “Space Warp” button to produce a worm hole to make your way to Linux, then read on. 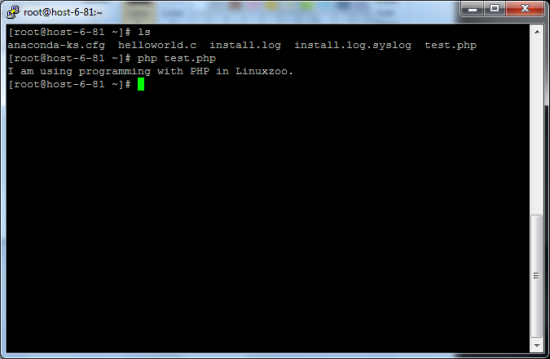 Linuxzoo makes it really simple for you even if you have little or NO Knowledge about Linux. Visit their website to sign up for a free shell account. All you need to do is to provide them your email address and a password and you’ll be presented with a screen to fuel your jet-pack and get going. When you login into your account, you would require to click on “Join Queue” to join the queue as this system is a shared one and Linuxzoo assigns you a position in a virtual queue. 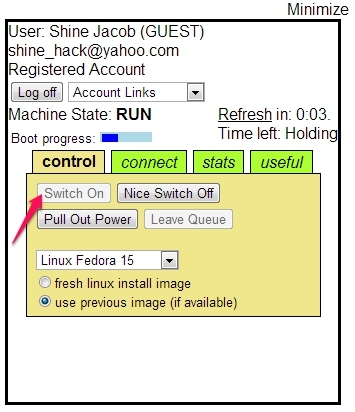 Once it’s your turn, you can start your Linux shell by clicking on the “Switch On” button. Just wait for around 30 seconds and there you go. You’re now ready to connect to the remote free shell account. Once you’ve started your system up, you can connect to it with any of the links available there on the screen. I personally like the Telnet method of connecting to a remote machine. You can use the inbuilt JScript Telnet and you’ll be given the username and password to start a new session for this free shell account. If you choose to connect to the remote machine using a Telnet Client, you can copy the link next to the “URI Telnet” and with it with your favorite Telnet client. As I tried to connect to Linuxzoo with Windows 7, I could not have access to the default Telnet Client (disabled by default) so I used Putty to access this free shell account. Here is how it looks in Putty. Where should I land my SpaceShip? You’re in contact with the base station and ready to land your spaceship and start exploring this amazing world of Linux. Linuxzoo gives you easy to understand tutorials on their website. Start reading them and it will give you the basics to get started. And believe me, you’re not gonna find huge changes while you use different Linux Distros and it would be easier for you to adjust with other Linux Distros. Linuxzoo lets you access to Linux system remotely hence it can be the best tool when you wanna get started with Linux. With this free shell account, you don’t really need to have access to real Linux system until you’re comfortable with Linux. Linuxzoo lets you have the flexibility to access it through the browser or using a Telnet client that lets you learn Linux right from the comfort of your current operating system you’re using. This free shell account lets you save your files or programs you’re working on and access them later at any time. Linuxzoo lets you access a readily available Linux system to play around with, so you don’t need to have any knowledge of Linux Operating System installation. I liked Linuxzoo cuz of its free shell account and tutorials for beginners. It is clear that they’re encouraging people to get started with Linux and that’s a nice thought. Learn something new today, get started with Linux. While you’re learning Linux, you might also want to start programming. Check out this review about this cool cloud coding environment.